Right across Rotherham the political scene is hotting up for 2014! Candidates are being chosen and, for some, the campaigning for next years elections has already started! Rothpol has resisted the temptation to become associated with any Political Party and nothing that follows, should be taken as indicating partisanship on Rothpols part. Not that Rothpol suspects, this will be believed by Akhtar? The potential for conflicts of interest, has prevented Rothpol from accepting invitations to meet with any political grouping or party in recent years, for fear that Rothpols independence would be compromised. Rotherham Politics exists to bring information to a wider audience, therefore it is necessary for Rothpol to personally investigate and report on political developments, voters may wish to take into account when deciding who to vote for, next May. Rothpol recently accepted an invitation to meet with some Respect Party members. Respect, is Rotherham’s newest registered political party and Rothpol was keen to find out more from ‘the horses mouth’ as it were. What Rothpol discovered was a group that is outward looking and determined to have an impact on Rotherham’s political scene, in the months and years to come. Rothpol was impressed with their evident enthusiasm for the battle of ideas and feels sure that there will be eventual success for Respect in Rotherham. The political platform that Respect espouses would be instantly recognisable to any Labour member that lived through the period before Blair took over Labour in a ‘Palace coup’! They are an avowedly socialist party and therefore, perhaps attractive to Rotherham’s disillusioned, stay at home, Labour voters? We shall no doubt see, in the fullness of time, what impact Respect has one advantage currently, they already have Jahangir Akhtars undivided attention! On a more personal note, Rothpol is happy to report that, he was made to feel most welcome, which is always a good start for any nascent political party seeking change! Finally, Rotherham Respect are in the late stages of organising their next public meeting for November, more on that to follow, once known! If curiosity takes you there, you may well be impressed! So there you have it, whether readers support Respect or not, they will be a welcome part of Rotherham’s developing political scene! This entry was posted in Abuse of power, Information, Respect and tagged Respect Party, Respect Rotherham, RMBC, Rotherham Metropolitan Borough Council, Rotherham Politics by Rik. Bookmark the permalink. From what I know of Respect (which admittedly may not be much) they do seem like a rather one dimensional party who target Muslim areas, do they have wider ambitions? Also having Galloway as their figurehead does them no favour with the average voter, massive drag factor if they are looking to enter the mainstream. All in my humble opinion of course! The general thesis with islam is that all areas will be muslim areas. The word means submission. I honestly believe this view is held by only a small minority of Muslims. Most people who follow Islam just want the same things we all do. Every religion has its extremists, and they are the ones who get on the news. … and a very small minority at that. ( … and it’s equally true for all the theist religions – Judaism, Christianity and Islam). From what I understand Islam means peace. Average Rotherham West Voter, please register your identity with Rotherham Politics should you wish to comment further. Average Rotherham west voter: This is a democracy, The Respect Party won’t be the only party who will have candidates in Rotherham West. There will be other parties who will also have their candidates standing in Rotherham West. It is the voters who will decide which candidate wins. 2014 Local elections will spring a lot of surprises. Let’s wait and see, Nobody has a crystal ball To see the future. No they don’t. The majority of voters in Rotherham West did not vote for Asbo last time he stood. Check it out, he got more votes than the other candidates, but the majority of voters in the ward did not vote for him! How can anyone vote for a party with Galloway as a leader? Just one example of his economy with the truth. Tommo please understand what theory means. If you don’t know what “theory” is don’t please accuse people of lying. End of the day he said it is a theory. please watch it 7:09 onwards and George Galloway has answered your question. Nobody, just nobody, knows what is going on in Syria. I have many reservations about Galloway, but few about many other members of Respect. Galloway is not the “leader” of the party. Yes I have a fair idea of what those terms mean, I was asking will Respect stand in all areas of Rotherham or just the ones with large Muslim populations? Not insinuating anything, genuinely curious. Everyone is entitled to their own opinion on the Respect party. 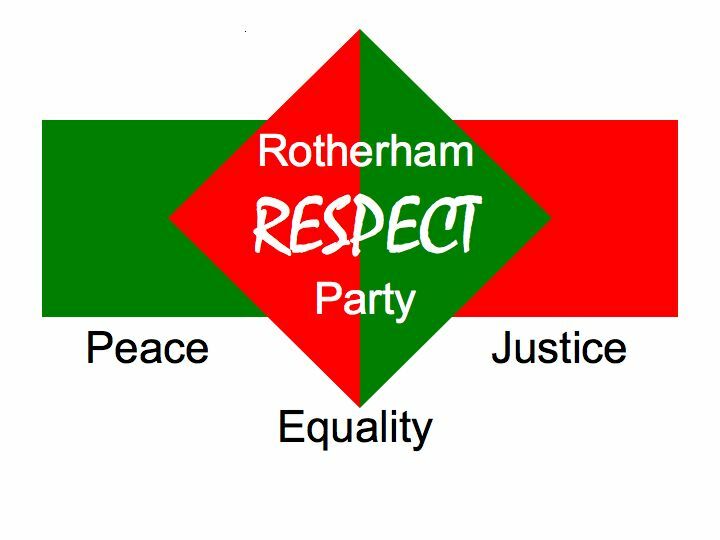 I personally think Respect will be great in Rotherham if they get a chance. Their policies are very much like the old Labour Party before Blair turned them into capitalist. I’m sure we’ll hear about their wider ambitions at this public meeting. What made you succumb to the temptation to meet this particular party, Rothpol ? Your post sounds rather like an endorsement of them – or am I misreading the intentions behind your meeting with them as opposed to any other party ? I am acquainted with many others already. I will be reporting on their activities at a later date. Will I be accused of partisanship and bias towards or against any political party or group, just because they are featured on Rotherham Politics? Unfortunately, I expect I will! Is this possibly the reason for the recent attacks on you in that other blog? I would like to point out I am not a Muslim. I have met the members of respect party in Rotherham. I must admit They are not seasoned politicians, but They certainly are sincere. I do not believe they are a Muslim party. Because most of their Supporters Are non-Muslims, such as stop the War coalition and Trade unions, Anticapitalist, Anti-austerity etc. The values and policies of the Respect party Are very much like old Labour. THEY HAVE GOT MY VOTE. Why all the fuss because Lovedinnington asks a legitimate question in order to illicit some information we dive in saying Respect is not a Muslim party; then his intelligence is insulted by asking if understands certain words. He at no time suggested it was a Muslim party he asked would they be turning out to the wider electorate. A simple yes or no would suffice. Will I get the same treatment if I ask can anyone tell me what UKIP stands for and why Farage is at the Tory conference. I have too many qualms about respect – especially YR – to vote for them. The Tories and UKIP are a no no for me. As for one of my reps – Mr A – a definite no no. I will wait and see who stands. And since I usually justify my points here is why I have no time for Yvonne Ridley and Respect. Sorry Yvonne and Respect – as most know I’m an old lefty – but vote for this? Ah errm noooo! “When Respect takes control of those councils in the May elections, they will be hoisting up the Palestinian flag”. “While the killing of innocent people is to be condemned without question, there is something rather repugnant about some of those who rush to renounce acts of terrorism. They rather remind me of trembling slaves all scuttling forth for the approval of the boss class in the hope of receiving a few crumbs from the big man’s table … oh, if only they knew how pathetic they really are…. Sooooo 2013. Divorce isn’t nice – Yvonne but preferable to this. It was a pop concert Yvonne – come to see Black Sabbath at the arena with me in December. Though I’m sure you will not be too impressed by this aging rock chick when they belt our Paranoid and Snowblind. But hey its my choice. At least I have one. It is my understanding Yvonne Ridley will not be standing in Rotherham. Would love Respect to thrive and grow..but they are too dominated by Gorgeous George and his hobby projects. For example go to their web site today (, http://www.respectparty.org , and the front page is about George’s plans to create a video making the case for Tony Blair to be tried for war crimes. Regardless of the case for or against Blair, I don’t see how their campaigners are going to run with this one on the streets of Grimethorpe, or Balsall Heath or Hackney, where people are ar more concerned about jobs, housing, education and immigration (while they may have a very different policy to UKIP on this, they can’t pretend it isn’t an issue in the minds of the electorate). Run through the site and it seems a Galloway blog, rather than a political party site – save for the fund raising of course. To become a serious party they need to have a much broader and stronger range of policies. More, they need judgement to place and promote those policies in order of importance to the electorate. I would love them to thrive, but fear they will implode under the pressure of George’s ego and the absence of strong alternative leaders. But give me some poliies and I would think about voting for them, especially at local level as the alternatives are so rubbish. Certainly the first (i.e most recent) item on http://www.respectparty.org is about the level of current amount of funding for a video on Blair (which I agree, is Galloway’s pet project), but the other items on the same page are about somewhat more conventional political activities. Hi RR, don’t misunderstand me, as I really want to see an enthusiastic even idealistic young socialist movement and hope that Respect can be just that. I especially applaud it for drawing in young Muslims who are sick to death of the biraderi, and the failure of the the “back home” elders who don’t understand the issues of young people today. The ones who want to be good Muslims, while being part of a 21st Century Britain. As you will know, web readers are rather fickle and don’t give any site much time. Hence the importance of that first page. It comes over as a bit naive. I wish Respect the best of luck. But to be honest, George may be a short term bonus, but he may be a long term liability. This is a genuine question: Is Yvonne Ridley suffering from Stockholm syndrome? The usual meaning of Stockholm syndrome (empathising with one’s captors) just doesn’t seem to fit. Councillor Jo Burton has been delivering Labour’s latest propaganda sheet in some parts of Anston. Eric Pickles announced a Council Tax freeze almost as soon as he took office and this has been extended until 2016, however some councils are ignoring this and raising Council Taxes. Rotherham included. Council tax in Rotherham is rising by 4.7 per cent from this month. In Sheffield the figure is 2.8 per cent, 3.9 per cent in Barnsley and 3.9 per cent in Doncaster. Unfortunately the lies and sheer misinformation peddled by the Labour party is swallowed wholesale by their core voters-aka Compliant Drones- so we in Anston have a battle to fight until the elections next year. War-monger Blair, aided and abetted by Campbell and Lord Mandy succeeded in introducing and reinforcing voter apathy on a massive scale and in local elections (as was posted previously) the % of eligible voters who actually vote is falling. It is not the number of parties we should be concerned about but the quality of the candidates and in this instance we now know Labour party councillors (and their candidates) tell the biggest lies. This is why it is Time for Change.